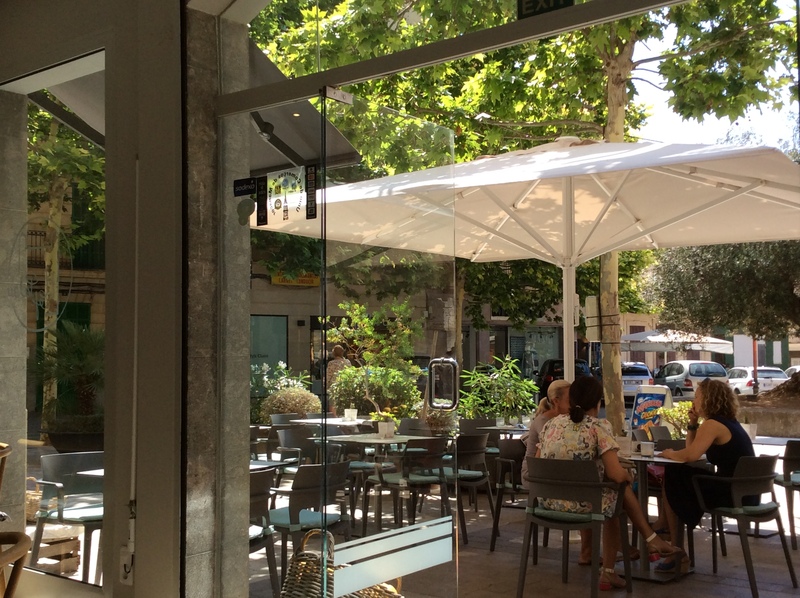 Insider tip for a good café in Manacor . 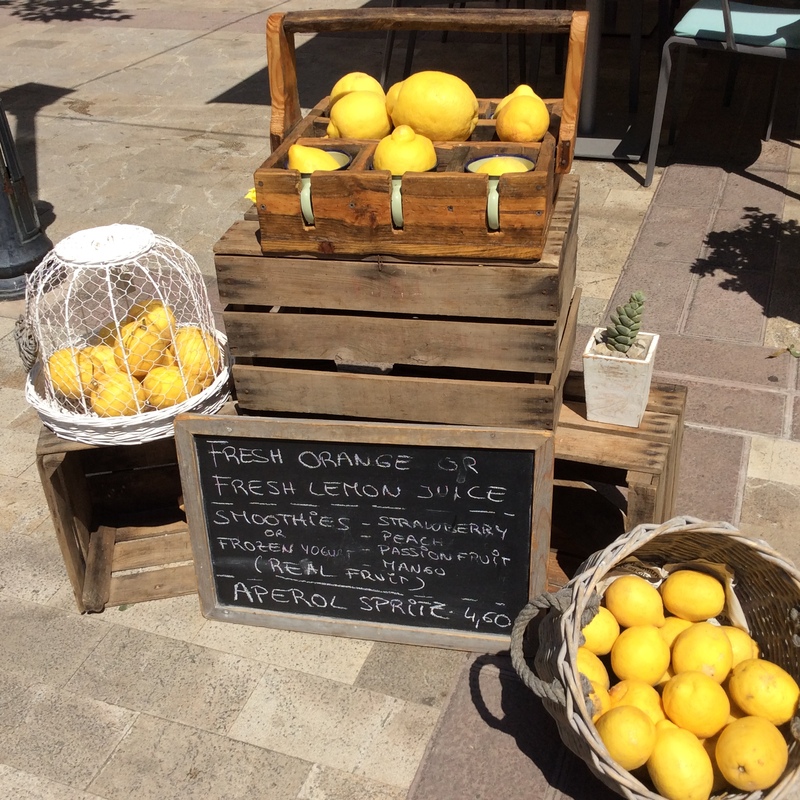 . .
Whatever your reasons for visiting Manacor – and there are quite a few good ones – chances are that you’ll want a coffee/cold drink/something to eat while you’re in the town. But, with numerous cafés and bars in town, which do you choose? Our recommendation is El Palau. 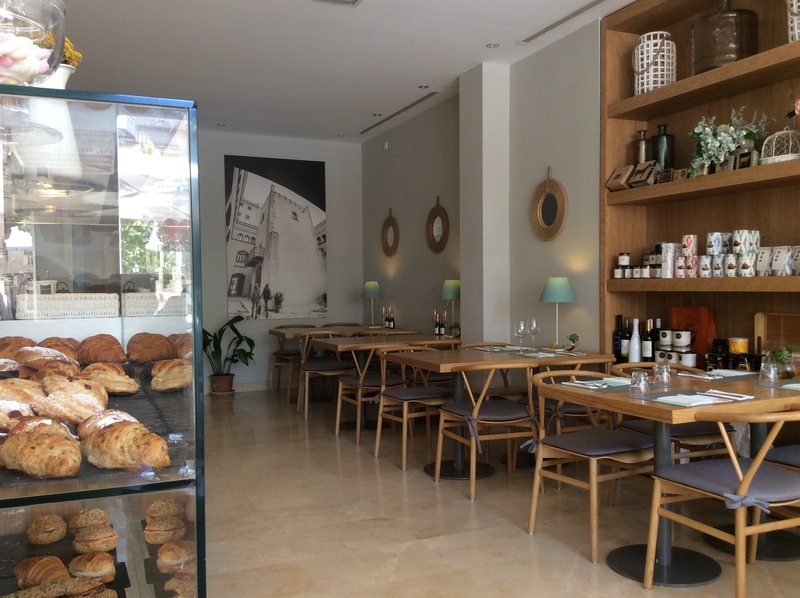 This bright and smart café sits opposite Manacor’s imposing church and an ancient olive tree. It has shaded terrace seating and a spacious interior with attractive décor. The premises had been a café for many years before it changed hands and underwent a complete transformation. 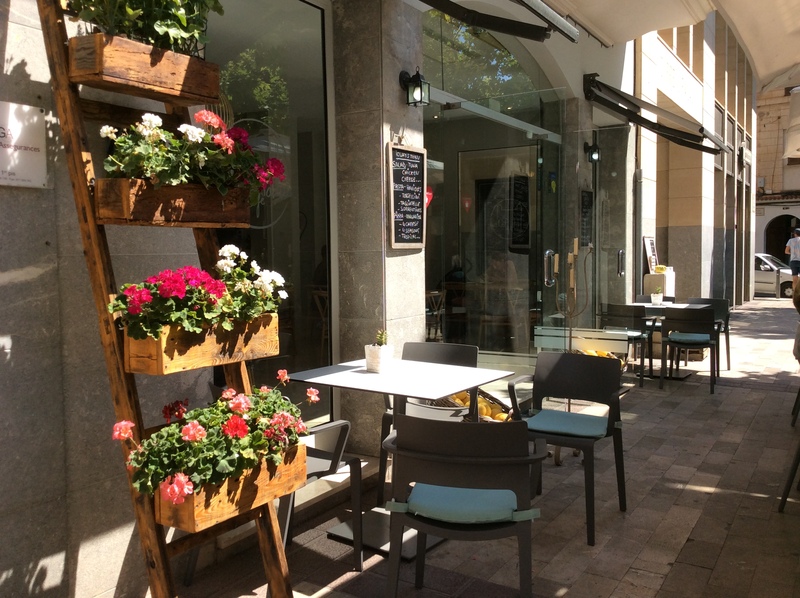 Its now a top place to drink or have a bite to eat in the centre of Manacor. Fresh from the garden, and awaiting customers at Cafe El Palau. Attractive decor inside (and air-conditioned). 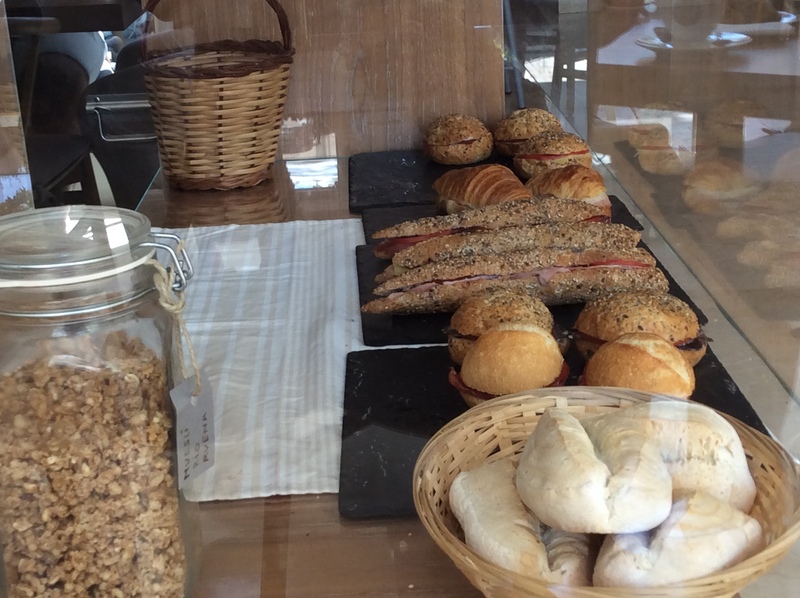 Pick up some gourmet goodies while you’re here. From interior of El Palau to terrace. They use Marabans coffee – from Mallorca – and we’ve always had a good cup of coffee here. This morning The Boss had a frapuccino and declared it the best he’d ever had. I did have a small sip and although I only take coffee black usually, it was excellent. El Palau also offers a range of Marabans teas and, in the summer, iced tea. Smoothies and juices are good, and they offer cakes (some home-made), pastries, and filled rolls for those with a small gap to fill. In the evenings, it’s worth trying a cocktail here. For lunch, try a pizza (8 varieties, including a vegetarian), ranging from 7,80 euros to 9,50 euros; choice of pasta dishes (all under 10 euros), and five different salads (8,50-9,50 euros). Nofre, the friendly man who runs the place, uses fresh fruit and vegetables here from his partner’s garden. And lots of stuff is home-made: he makes the pizza bases on a Sunday afternoon and freezes them for the week ahead. So no mass-produced pizzas here! The pasta is artisan-made by an Italian friend of his. On Friday evenings El Palau stays open later for those who want dinner at a more customary time for the Mallorcans. And there’s sometimes live music to add to the great ambience of the place. Turning Japanese . . . In winter months, Friday nights are Japanese cuisine nights; read about them here. 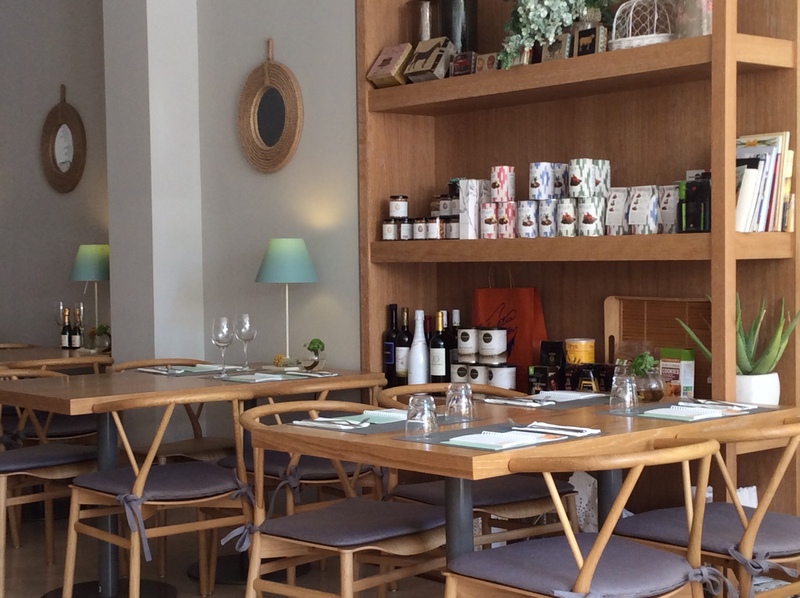 Nofre has created a café that’s doing something different to many of the others in the town. He likes to practise his English, so if you don’t speak Spanish, this is definitely a place to head for. Closed Sundays (when Nofre is gardening and making pizza bases! ).